Dr. Anthony L. Manning built the house at 36 Main Street sometime between 1861 and 1865. The 1877 Will of Dr. Anthony L. Manning describes his house at 36 Main Street as "the frame dwelling and lot with all the improvements thereunto belonging built by me, and adjoining my hotel property in East New Market". A storehouse and small tailor's shop occupied this lot by 1853 as evidenced by an equity court case. A close inspection of the current house reveals the front, middle, and rear sections were not built at the same time. The rear of the house may be older. Dr. Manning possibly incorporated parts of an earlier structure into the new house. 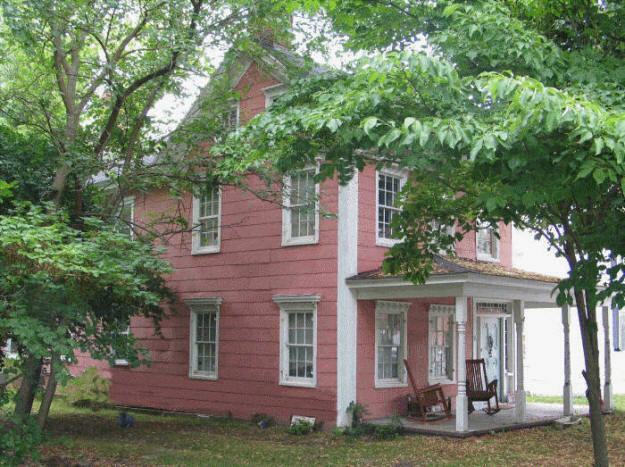 In 1865, Dr. Manning advertised for rent of sale, an elegant new Dwelling and outhouses. A tax record from 1862 assesses $1,050 of improvements on this lot. D-689. The Dr. A. L. Manning house stands on the west side of South Main Street near the main intersection of East New Market, Dorchester County, Maryland. The two-story, three-bay frame house faces east with the gable oriented on a north/south axis. Probably built around 1850-1860, the two-story side hall/parlor frame house is supported by a minimal brick foundation and sheathed with asbestos shingles. The medium sloped gable roof is covered with asphalt tile. Attached to the back of the house is a long two-story service wing. The east (main) facade is an asymmetrical three-bay elevation with the entrance located in the north bay. The mid nineteenth-century paneled front door is framed by four-light sidelights and a multi-pane transom. The adjacent two bays are filled with six-over-six sash windows. Each of the windows has a heavy, dentiled cornice, and pairs of louvered shutters. Stretching across the first floor is a hip roof porch supported by turned, Victorian posts. The second floor is lighted by three six-over-six sash windows trimmed with the same decorative cornices. The cornice above the second floor windows is marked by a row of brackets, and the corners of the house are fitted with simple pilasters. The north gable end is a blind wall aside from a pair of four-over-four windows that light the attic. The attic windows are distinguished by the heavy dentiled cornices as well. The south gable end, on the other hand, is marked by pairs of six-over-six sash windows with dentiled cornices on either side of the interior end brick stack. Attached to the west (rear) side of the front block is a long two-story service wing with a central brick chimney protruding through the roof. A seam in the cornice at the mid-point of the wing suggests two periods of construction. The eave is trimmed with a plain boxed cornice, and each floor is lighted by six- over-six or two-over-two sash windows. A shed addition extends from the west gable end of the wing. The interior was unseen. The Dr. A. L. manning house is one of more distinctive nineteenth-century dwellings that distinguish the center of East New Market. Probably built during the middle years of the century, the house is embellished with unusual dentiled cornices over each of the window openings, and the front block is trimmed with corner pilasters and a bracketed eave. Attached to the back of the house is a long two-story service wing that appears to have been built in two stages. Although the interior was not seen, the house appears not to have been altered significantly. The structure appears on the 1877 town map under the ownership of Dr. A. L. Manning. The Mannings owned the property next door as well which contained the "Temperance Hotel," now popularly known as the "House of the Hinges.